1; Temperatures will be mild Monday but a big plunge in temperatures with possible snow mix is ​​coming beginning Tuesday. Our Severe Weather Team 2 Meteorologists have been tracking the arctic front as it makes its way across the country toward Georgia. Gov. 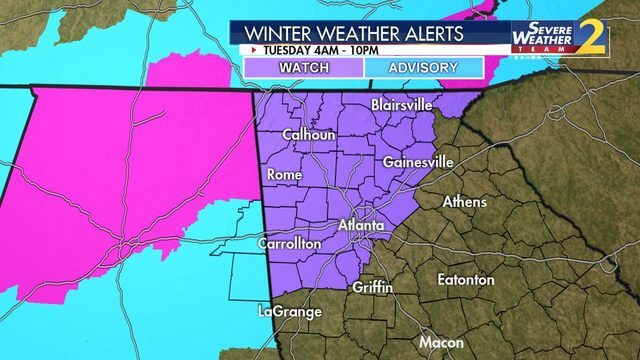 Brian Kemp ordered Monday morning that all state offices will be closed Tuesday due to winter weather. "If you don't need to be on the roads, please don't travel," Kemp said. Atlanta City Hall hours will be canceled Tuesday, Mayor Keisha Lance Bottoms said. Atlanta Public Schools' superintendent Meria Carstarphen announced that schools will close Tuesday. Bottoms said her office is in constant contact with the NFL as nearly a million visitors are expected to be at the Super Bowl this week. Severe Weather Team 2 Meteorologist Karen Minton has been tracking winter weather in metro Atlanta for more than 30 years for Channel 2 Action News . She said the band of snow mix will start entering the north Georgia mountains early Tuesday morning and then move into metro Atlanta in the afternoon. We're using the most advanced weather technology to continuously update the timing  Atlanta officials have already begun treating roads with brine ahead of the winter weather. Behind the snow mix will come a dramatic drop in temperatures. Wind chills will drop into the low to mid teens across much of the area with single digits expected in the North Georgia mountains late Tuesday into Wednesday morning. Winds will rise behind the cold front during the day Tuesday and persist into Tuesday night. Expect northwest winds around 15-20 mph with gusts up to 25-30 mph.